The Australian Securities and Investments Commission has confirmed it is making “some enquiries” into a local cryptocurrency startup which was once promoted by Australian cricketing great Michael Clarke. The startup, Global Tech, popped up a few months ago with the goal of raising $50 million via an initial coin offering (ICO) to launch a cryptocurrency-fuelled social media network and currency exchange. 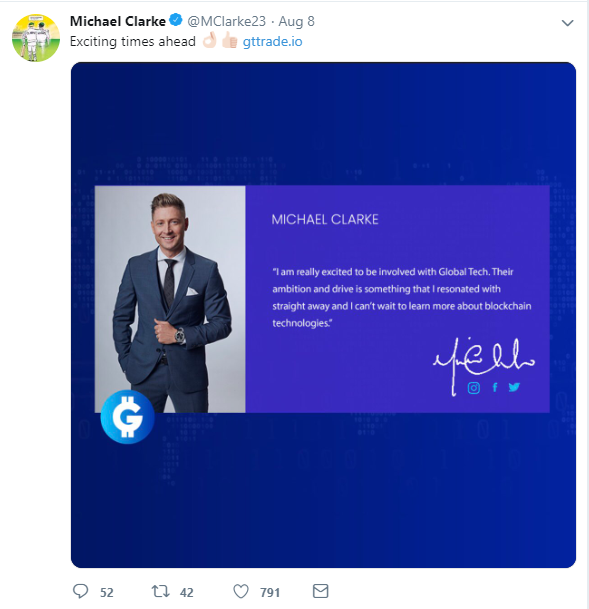 Upon the company’s launch, Clarke was recruited to promote the startup’s ICO, with the sports legend appearing on the company’s website as an ambassador, and posting a number of tweets in support of the product. However, the endorsement was widely panned by the media, commentators and experts, who questioned why the sports star would support a company operating in the highly volatile and emerging cryptocurrency space. Despite the criticism, at the time the company claimed it had managed to raise $4.15 million from investors. According to investor information documents, ambassadors such as Clarke were set to receive 4% of ICO funds. However, the company has since shut down its websites and all social media pages, plus a number of its staff members and founders’ LinkedIn accounts. The company is also in the process of being voluntarily deregistered, according to Australian Securities and Investments Commission documents. The founders told Fairfax Media they had “returned all funds invested”, and decided to shut the project down due to “ongoing negativity surrounding the (bitcoin) space that we do not wish to be associated with”. Companies watchdog ASIC has also confirmed to SmartCompany it is making “some enquiries” into the crypto startup, with a spokesperson saying it was doing so as part of its “general and ongoing oversight of aspects of the so-called cryptocurrency sector”. In an unusual move, an investment manager at the regulator independently reached out to SmartCompany journalists via email to inquire about the amount raised by the startup, further indicating the interest taken by the regulator in Australian cryptocurrency startups. At the time, local cryptocurrency startup founders also questioned the quality of the project, with CanYa founder JP Thorbjornsen telling SmartCompany Clarke was “out of his depth” and risked his reputation taking a hit if the project fell over. “Michael Clarke has now pinned his tech entrance on Global Tech, and if they go under or get called out, he’ll be left smeared. It’s a bit different to running an ad for a shoe or male perfume, it’s much higher risk,” Thorbjornsen said at the time. SmartCompany contacted Clarke but did not receive a response prior to publication. SmartCompany also contacted the Global Tech founders but did not receive a response prior to publication.